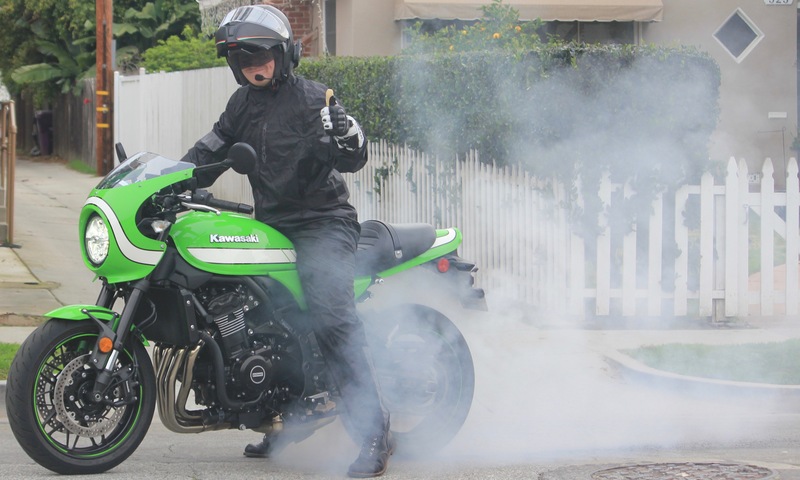 You know what’s better than being wet and cold while riding a motorcycle? 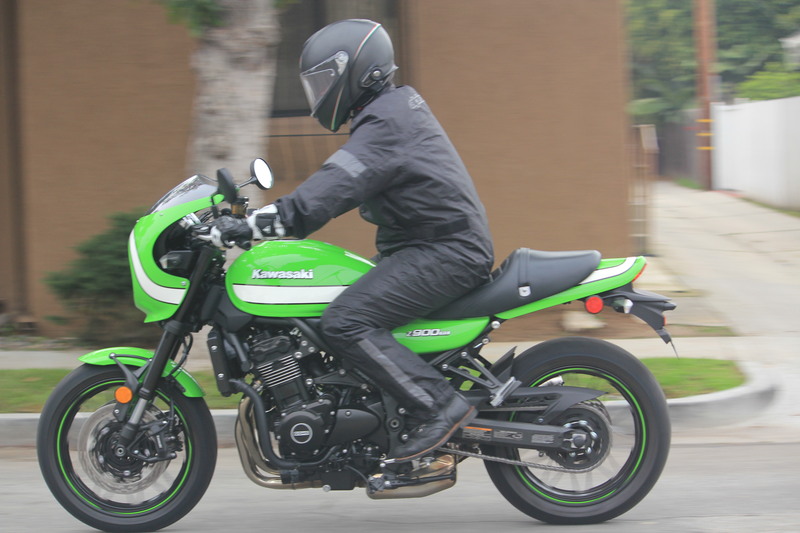 Not being wet and cold while riding a motorcycle. 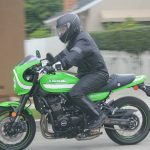 A few months back I was headed to my homeland, the Midwest, with a promise of big V-Twin motorcycles, and crappy weather. Since I’ve been calling Southern California home for nine years now, I haven’t kept too many waterproof bits of gear around. 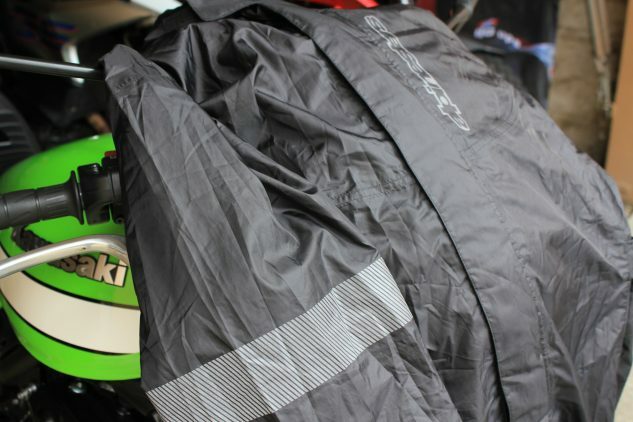 It was only after I had attended back-to-back rainy press launches, spanning the globe from Spain to SoCal, that I decided I would contact the nice folks at Alpinestars to procure a full one-piece rain suit. Two colorways are available and sizes range from S-3XL. The Alpinestars Hurricane is available in both one- and two-piece versions in either high-viz yellow and black or solid murdered-out (black). After experiencing what it must be like to ride headlong into a monsoon near the Costa del Sol (ha!) in Spain, I opted for the one-piece. Looking back on that decision, the two-piece may have been a little easier to slip into, but I was more concerned with having as few seams as possible. 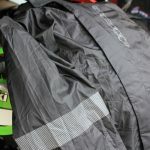 The Hurricane is made up of a waterproof PU-coated poly-nylon fabric which Alpinestars says had been specifically treated on the inside to not get hung up on your gear while pulling it on. There is also a mesh liner throughout. Reflective detailing is found on the arms and legs and along the upper back on the logo. Sizes are available from S-3XL and fit can be tailored slightly by adjustable Velcro straps around the waist. All of the printed details on the suit are also reflective. The one-piece that I opted for has a zipper running from the neck down to just above the left knee for EZ access. 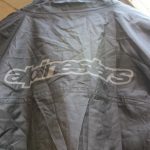 In an attempt of waterproofing, A’stars uses two flaps, one with Velcro, that overlap on top of the standard zipper (not taped). Both legs also have gusseted zippered panels that run most of the way up the calf which helps when getting in or out of the suit with larger boots on, as well as allowing a tighter fit once zipped down. The elastic found on the back of the collar, and the cuffs were tight enough to keep water from sneaking in. 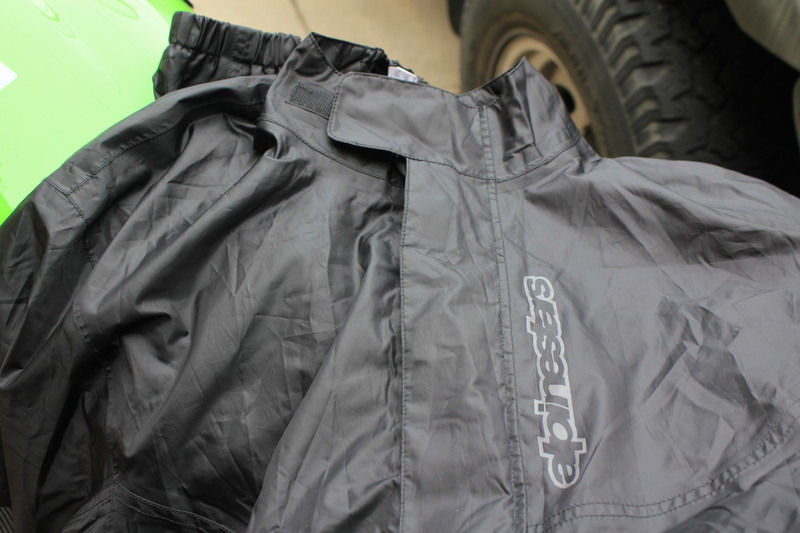 The size large gave me plenty of room in the Hurrican rain suit. A medium would have probably been less baggy around the mid-section. I was sent a large, which was quite easy getting in and out of and plenty big enough to fit over my size medium/euro 50 chassis. I believe I could have fit into a medium sized suit, but the large is likely easier to get in and out of, and with the waist straps, it didn’t flap around in the wind too much. After spending no less than 10 hours riding through a torrential downpour, as I made my escape from Illinois, I would say I gave the ol’ Hurricane a pretty thorough testing. The Gray Whale (a $39,999 2019 Harley-Davidson CVO Limited) and I managed to keep the rubber on the road despite the 15 or more cars we passed in ditches who couldn’t. The Hurricane kept me dry, that is, until it didn’t. The collar closed up nice and tight with the help of a small elastic section on the back. For the first four or five hours of riding in rain so hard I could barely see two or three bike-lengths in front of me, I was happy as a clam, mostly, because I wasn’t as moist as one (try to keep it together, gentlemen). It was that one wrong move. Something changed. 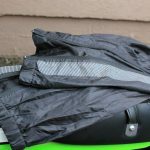 A slight adjustment in my seating position on the bike gave way to an unnoticed pool of water that had gathered near my crotch. 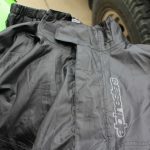 Turns out two flaps of PU-coated poly-nylon aren’t actually going to stop pooling water from pouring right through the normal zipper A’stars decided to use on the Hurricane Rain Suit. 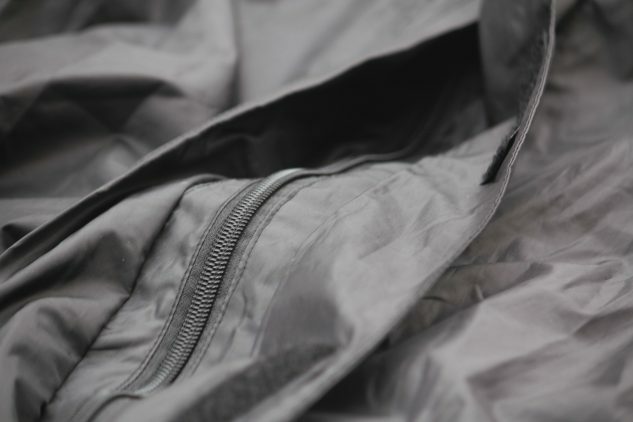 This zipper is not waterproof, no matter how many PU-coated flaps are in front of it. 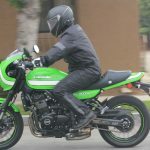 Had I been riding another kind of bike with a different seating position, this may not have happened, but on the Harley, I ended up wet from mid-thigh to my belly button for the duration of my rainy cruise. Perhaps a waterproof taped zipper would have done the trick? A last line of defense after the PU flaps. Maybe Alpinestars felt that would have priced the suit too high. 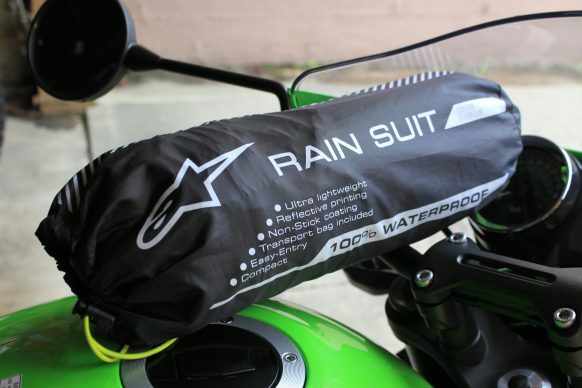 At $119.95, I might have considered paying more for a waterproof zipper. After my experience, I definitely would have. Keep in mind this was some of the worst rain I’ve been lucky enough to ride in for so many hours. I’m from the Midwest. I’ve ridden in rain like that before, but not for 10-plus hours. For the suit to hold up for four to five hours in these conditions, I would call it somewhat of a success. 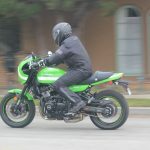 If your bike has you seated in a position that leans forward more, you may never run into this issue. 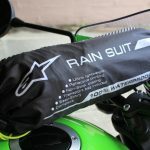 I still use this suit in the rain and haven’t had the chance (thankfully) to wear it in conditions quite so intense, and it has kept me dry. 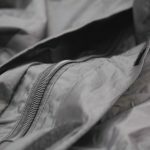 If the idea of a moist crotch turns you off, the two-piece version could be a good option – no zipper on the pants. Just pull the pants up above your belly button to be sure. 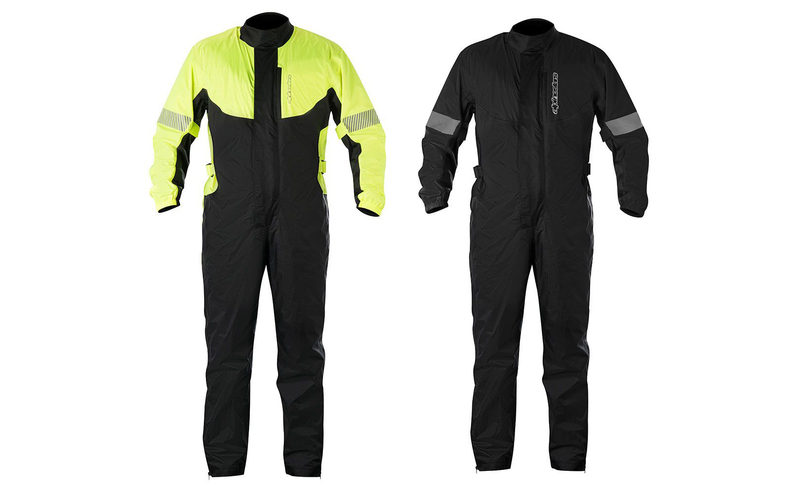 The Alpinestars Hurricane Rain Suit is available from Amazon and other retailers.